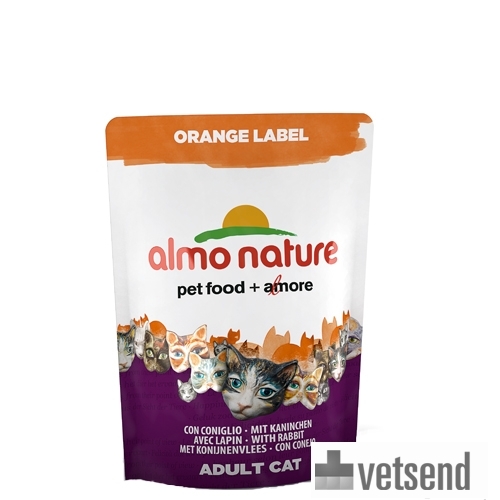 Almo Nature Orange Label Adult Cat Food is a dry food consisting of natural ingredients with added vitamins and minerals. For adult cats, the Orange Label range from Almo Nature offers Almo Nature dry cat food. This dry food is nutritious and easily digested food for cats, with a high percentage of meat. This makes the food even tastier! Aside from the natural ingredients, the food also has added vitamins and minerals, providing for your cat's every nutritional need. This makes it a healthy and responsible meal for your cat. Almo Nature never uses chemical preservatives, colourings and/or other chemical additives to make the product look better, and is always preserved naturally. This food is available in various flavours. Almo Nature recommends that you combine this dry food with wet food. For an optimal nutritional balance, Almo Nature recommends that cats are given 60% wet food and 40% dry food daily to provide 100% of their nutritional requirements. Have you used Almo Nature - Orange Label - Dry Cat Food before? Let us know what you think about this product.